Preparing for the MOTUL FIM Superbike World Championship finale under the floodlights in Qatar, Pedercini Racing SC-Project have announced Jeremy Guarnoni will ride for the team in the Qatar Round of the series. Stepping in for Riccardo Russo, who the team say has left following a tough end to the season, the French rider will make his debut in the WorldSBK class after finishing in the top six in the European Superstock 1000 Championship this season. Competing in WorldSBK back in 2014 with MRS Kawasaki, the French rider was able to secure 14th position in the championship, but was unable to score any points around the Losail International Circuit. However after three seasons in the STK1000 championship, the French rider will have even more experience behind him on the ZX-10RR to prepare him for his entry. 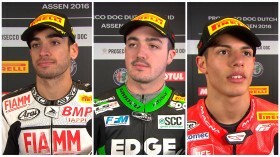 Follow all the build up, or remind yourself of some stunning races at Qatar as WorldSBK prepares for the final round, all with the WorldSBK VideoPass. Guarnoni: "The bike was perfect all weekend"